For the past few years, I’ve been trying to achieve a paperless office and a paperless life. I try to get companies I deal with to send me electronics bills. When I buy something from the Apple store, I have them email me the receipt. I try to do all my reading online or in eBook format. However, not every book or document is available in a digital format. As much as I’ve tried, I still get a ton of paper that I need to organize. The idea of the paperless office was established some 30 years ago when the first PC was born. However, the tools to achieve a life without paper didn’t fully materialized until recently. Thanks to advances in scanning technology and cloud services, the true paperless office can finally be achieved. A paperless office offers many advantages such as increased productivity, improved client services, reduced operating cost, better security, good for the environment, etc. I’ve created a paperless office and paperless life using two core technologies. 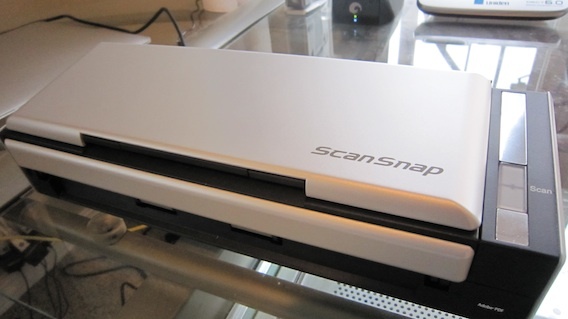 The ScanSnap S1300 by Fujitsu is a mobile sheet-feed scanner that turns any scanned document into a searchable PDF file. The keyword here is searchable. Scanning a document doesn’t improve your productivity over just putting it into a filing cabinet. By turning the file into a searchable PDF, it makes a it lot easier to retrieve at a later date. You can also use a colored highlighter pen on a black and white document to create searchable keywords automatically. While the S1300 can run on USB power, I recommend you plug it into a wall outlet if you’re near one. Scanning speed is cut in half when the S1300 is powered by USB. Everything is operated by a single button. Push it and the 10 page automatic document feeder scans both sides of each page. The S1300 automatically recognizes the size of each document, detects and corrects for skew, and shows images in their proper orientation with blank pages removed. So the Fujitsu ScanSnap S1300 is what I use to kill the paper. The next question is how do I organize all those PDFs and more importantly, how can I access them from anywhere in the world so I can maintain The Dot Com Lifestyle?